A new iOS software update includes over 300 new Emojis, the likes of which include many LGBT and racially-diverse characters. The latest Apple operating system update includes a new set of diverse, LGBT emoji for users to send via iMessage to friends, family, and loved ones. iPhone and iPad users who have been yearning for more inclusive representation in their lineup of over 300 emoji found a pleasant surprise Wednesday, when the new iOS 8.3 update hit Apple products nationwide. 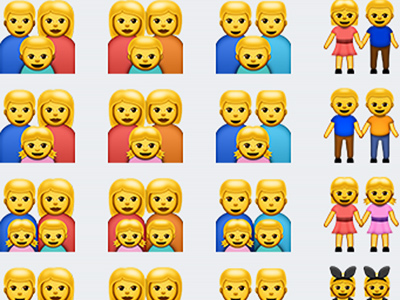 Included in Wednesday’s update were new emojis running the gamut from people of different races and colors, to families with two moms and two dads. Social media was abuzz with positive responses to the new emoji, especially on Twitter. Yahoo! News reports that while the tech giant has yet to make an official comment about the new emoticons, Apple has made declarative statements in the past that they "support and care deeply about diversity." Indeed, the company's out CEO Tim Cook — the only openly gay head of any Fortune 500 company — most recently criticized Indiana's controversial Religious Freedom Restoration Act, telling businesses and fair-minded Americans everywhere "it's time for all of us" to stand up to discrimination. Previous iOS updates earlier this year and as far back as 2012 included LGBT emoji, but this latest incorporation of more LGBT-friendly keyboard caricatures than ever before proves that Apple’s latest software update is the gayest one yet.